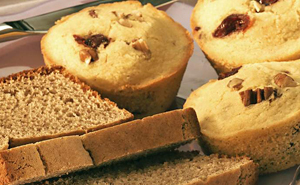 Because muffins are derived primarily from a gluten-free flour base, if you are converting a wheat recipe, you’ll need to add extra flavoring in the form of stir-ins (nuts, coconut, fresh, canned, or dried fruit, shredded carrots or zucchini, mashed bananas, applesauce or jars of baby fruit, chocolate chips, or even liqueurs) or added flavoring (extra vanilla, almond, or other liquid flavoring plus additional or increased amounts of spices). Add an extra egg and 1 tablespoon of mayonnaise to help the pastry rise. It also helps to substitute some of the liquid called for in the recipe with something more flavorful, like brewed coffee, juice, or sweetened condensed milk. This recipe already has these adjustments made, so start baking! Preheat the oven to 400 degrees F. Spray muffin tins with cooking spray. In a small bowl, stir together the milk and lemon juice; set the mixture aside for a few minutes to thicken. In a mixing bowl, use the mixer to whip the eggs and egg white for 1 minute. Add the thickened milk, sugar, oil, vanilla, almond extract, and mayonnaise, and continue to whip for another minute. In a medium bowl, stir together the flour mixture, coconut flour, cornmeal, baking powder, and salt. Add the flour mixture to the egg mixture; blend the dry ingredients in thoroughly using a whisk. Bake the batter for 15 minutes, or until a toothpick inserted in the center comes out clean. Cool the muffins slightly, and then remove them to a wire rack. Keep leftover muffins stored in the freezer to keep them from drying out. To thaw, wrap a muffin in wax paper and pop it into the microwave or wrap it in foil and bake at 300 degrees F for 15 minutes. With wheat flour muffins, the directions usually say, “Stir the ingredients just until blended.” With the gluten-free flours, whip the liquid ingredients first to incorporate air so the finished product will be lighter. Per serving: Calories: 183; Total fat: 8g; Saturated fat: 1g; Cholesterol: 28mg; Sodium: 185mg; Carbohydrates: 27g; Fiber: 2g; Sugar: 12g; Protein: 3g. Sift all the ingredients into a large bowl, and then stir them together with a whisk.